The season is rumbling along now. Week 5 sees my team attempting to bounce back from their first defeat of the season against another cellar dweller, the 1-3 Wapping Wombats. Both teams will be hoping that key contributors can bounce back from less than stellar weeks last time out while I will also be looking to avoid leaving so many points on the bench this week. Starting off we have a couple of waiver wire transactions to take a look at, neither appear to have superstar potential but both will hopefully make nice additions to the team. Ah Jamison, we hardly knew thee. Hopefully my mistake with Crowder will be short lived. Hopefully he won't go on to have a big week this week and make me regret dropping him. I guess we will find out, although regardless of what he achieves this week it is highly unlikely that he would make my starting lineup, unless there were a bucket load of injuries in practice, please don't let that happen! This is maybe a curious one. Chicago have been less than impressive all season but my merry-go-round of TEs continues with a guy who has picked up 3 TDs in two weeks. Now I don't expect that to continue but he is getting targeted by Brian Hoyer quite a lot since Jay Cutler went down. If Hoyer continues to start, a possibility with rumours swirling that Cutler is on the Trading Block in Chicago, then you would expect Miller to continue to produce over the coming weeks. Even if Cutler returns, the big TE should get his fair share of targets with Chicago's injury report longer than Santa's list at Christmas. The ginger ninja. There is a simple reason for this, I am nailing my flag to the Derek Carr mast. Andy will improve over the coming weeks as Eifert returns and the Cincinnati Offence becomes slightly less Green-centric. 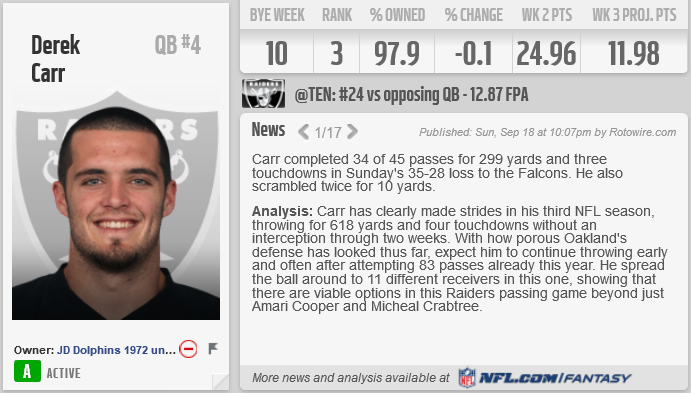 But he will not be starting for me as Carr and Oakland continue their rampant run out West. 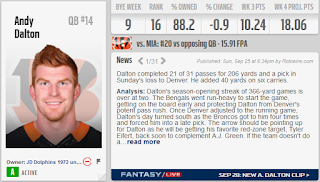 I will need a QB in week 10, right now I expect that Dalton will still be available, but if not there will be a long list of QBs available (10 players in the league, 32 starting QBs) for me to pick from for a single week of play. As an interesting aside, before we get into my team for the week, Justin Forsett has been released by the Ravens. This comes only 5 weeks after he declared himself the starting RB for the team and makes that new contract he signed with the Ravens towards the end of preseason look more than a little silly. After drafting him late on as an optional RB during bye weeks I released him in week 3 with his production being extremely poor. He will probably catch on with another NFL team but it is interesting to see how quickly you can go from hero to zero in the NFL. Well with that done, let's take a look at the team for the week. 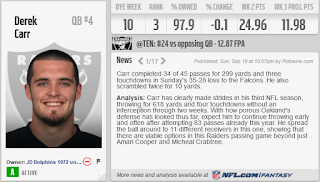 Carr is now the number 3 QB in fantasy points. He is surrounded by weapons that would make any QB in the league jealous and the coaching staff in Oakland have built a system around him that appears to be working to perfection this season. Last week he had 4 TDs through the air against a Baltimore team that limited him to only 199 yards (first time this season under 200). This week he faces an easier task against a San Diego Chargers team giving up on average 27 points a game. The only team not to put up 20+ points on them were the Jaguars with the ever erratic Blake Bortles at the helm. Opponent - Cam Newton (Proj. 19.26) - Cam has had two really tough weeks, he ran in a TD against Minnesota before everything went to hell in that game (3 INTs). Next he faced Atlanta and wound up throwing for only 165 yards and 1 TD. He will look to bounce back against Tampa Bay in what could end up being a shootout with Winston and Newton throwing the ball all over the field before the game is done. With Doug Martin still out these two were always going to be the picks for my backfield. Their only competition was Theo Riddick who continues to struggle to get anything going in a Detroit backfield without Ameer Abdullah. 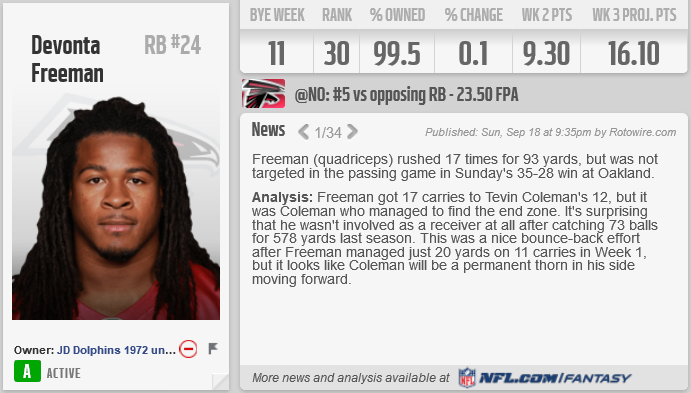 Surprisingly, neither of these RBs are getting much love from the NFL fantasy team. Right now DeMarco is the number 1 overall RB in all of fantasy, not only that he is the only non-QB player in the overall top 10 fantasy players, but he is only projected to get 7.40 points this week against the 29th ranked Miami Dolphins defence, come on guys. 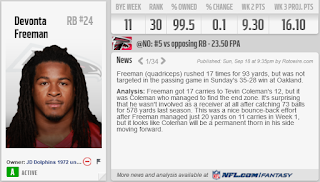 Devonta Freeman has a tougher match-up against the Denver Broncos but he can be expected to get his fair share of touches in the ground and passing game. Denver will have their hands full trying to contain Matt Ryan, Julio Jones and Mohamed Sanu which may give Freeman, and his backfield buddy Coleman, some decent room to work with. Opponent - Rashad Jennings & Frank Gore (Proj. 22.70) - OK, now I know that these projections have to be a joke. 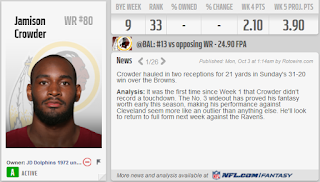 Gore is projected to get 14+ points against the Bears, maybe that is fair? I'm not sure, the Bears may be terrible but it wasn't until the 4th quarter that Indianapolis got anything going against the Jaguars in London. Rashad Jennings is projected to get 8.50 which I find even more ludicrous. This is a guy who hasn't played for two weeks, and he may not even be RB1 when he gets back, how is he projected to score more than DeMarco Murray? 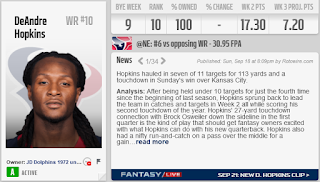 You can't drop Nuk, I continue to stick by this although it is getting harder with each passing week. He and Osweiler need to get back on the same page, the one they were on in week two against Kansas City. I have hope for him this week as it is not a case of Nuk not getting the targets in the Houston offence, 6 last week and 8 the week before, it's just a case of Osweiler and co not executing to the required level. Fuller will start drawing some tougher looks on the other side which should free up Nuk in the passing game, even if he doesn't you can't keep Nuk quiet for 3 weeks in a row, right? 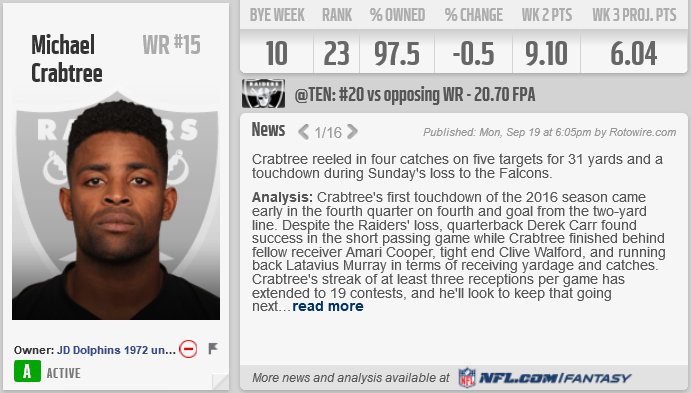 Crabtree is my other WR of choice. I dropped him last week for reasons that I cannot fathom when I look back at it. He has 23 targets in two weeks and 4 TDs on the season. Teams will continue to pay attention to him in the passing game but he is making his size work for him and the rapport he has built with Carr since last year will stand him in good stead going forwards. Next up is San Diego, their secondary likes to give up passing opportunities so I hope that Carr and Crabtree can link up for another big game. Opponent - Larry Fitzgerald & Mohamed Sanu (Proj. 10.20) - Fitzgerald could be limited by an injury to Carson Palmer while Sanu seems to be losing out on targets to Julio Jones which is understandable. I expect Sanu to do better this week and improve on his two catches for 22 yards, we will be on Palmer watch over the week to see whether Fitzgerald has his favoured QB or ends up having to try and figure something out with Drew Stanton who struggles to get the best out of his number one WR. I am struggling to get anything out of the TE position this season, hopefully that will change with Zach Miller. He has a modest projection this week, but that is the case with almost every TE not named Gronk. He's catching TDs right now so I will be going with the hot hand in this game. Opponent - Jason Witten (Proj. 4.10) - Dak Prescott's security blanket. Prescott likes to check down to a safe pair of hands in the TE position and 4.10 feels about right for Witten this week against Cincinnati. Surprise package for the first quarter of the season, Philadelphia, are back off their bye week and looking to remain unbeaten as they travel to Detroit. Jordan Matthews was the favourite target of rookie sensation Carson Wentz before the bye and they will be looking to build on that chemistry going forwards. The Detroit team that they are up against have struggled to contain WRs so far this season and it feels like a good match-up for Matthews to pick up some more points. I like the sound of 12 points although his last couple of outings suggest that this may be a little optimistic. Opponent - TY Hilton, WR (Proj. 13.00) - The Bears are beat up, the NFL.com "experts" don't like them, and it all adds up to a big projected score for Hilton in their eyes. Dorsett will take away some of his targets and his inconsistent play could hold him back. He has two TDs in as many weeks and against a bad Bears secondary it is reasonable to see another TD as a possibility, but 70 yards on top of that? Well that will be the question. Santos is on his bye week, I need a kicker, why not the number 3 kicker in the league right now? Atlanta will look to put up points on the board in bunches, Bryant will kick the extra points and if they fall short he can kick the field goals. 7 points suggests a couple of field goals and a TD, Atlanta have shown that they can do more than that in recent weeks so I will be hoping for a slightly better return from Bryant which could put pressure on Santos going forwards. Opponent - Brandon McManus (Proj. 8.00) - Bryant's opposite number in the ATL/DEN game. I'm not sure why he is projected to get more than Bryant considering his weekly totals are not comparable but they are both around the same number and that is to be expected from kickers. No love. I think this is the projection that bothered me the most this week. Over the past 3 weeks LA's defence have put up the following fantasy points, 11, 12, 17, they shut down Seattle and Arizona while scoring a TD against Tampa Bay. This week they face the Buffalo Bills and Tyrod Taylor without Sammy Watkins. Sure Rex Ryan's team are tough but they are not renowned for being an offensive powerhouse. I'm quietly confident that LA can pick up more than 4 points for me this week. Opponent - Carolina Panthers (Proj. 6.00) - They were one of THE defences to own coming into the season so it's not surprising to see them projected to score higher than LA. What is surprising is that they have only put up double digit points one week so far this season. They will want to make up for that poor performance last week against Atlanta, Jameis Winston may give them that opportunity as he continues to struggle with turnovers but he also has the potential to burn them for a lot of yards.